I can't help but remember this video of Gwen Verdon and two other companions dancing on a show in the 60's whenever I see Ribbon's Almark and his Innovator crew... its that sixties style wardrobe of theirs that's causing it... hehehe. 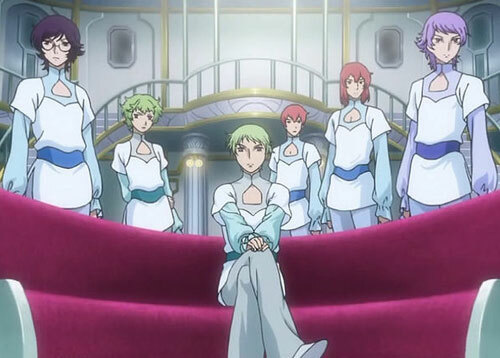 The Innovators were the main antagonist in the Gundam 00 Season 2 series. Anyhoo, this old video was kinda modernized with the Walk It Out soundtrack. To go off tangent a little bit further, the dance above was choreographed by the late Bob Fosse. Who some say could have been the inspiration for Michael Jackson's moonwalk, dance and dress style. This is based from his performance in the Little Prince movie of the seventies which was way before Michael's success as a solo pop star.